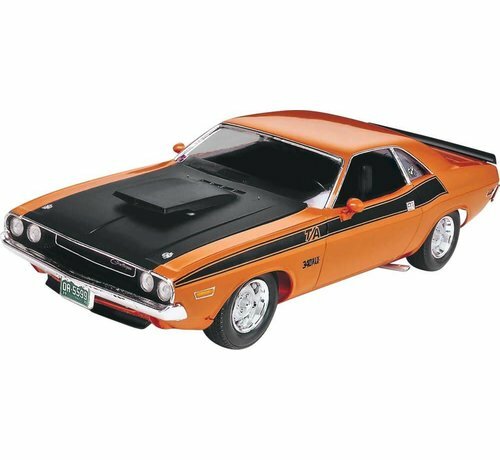 Dodge's entry into the pony car wars was the Challenger, and it more than held its own in hot company with the outstanding 340 cid small block engine. In fact, the 1970 Dodge Challenger T/A ranks as one of the wildest and most desirable musclecars ever built. Optional custom hood and high rise dual four barrel intake, rear spoiler, colorful custom graphics, and Centerline wheels. Choice of two versions - factory stock or street machine with dual 4-barrel high-rise intake. Highly detailed interior. Molded in white and clear with chrome plated parts and black vinyl tires. Requires paint and glue (not included). and was factory rated at 290 horsepower. custom Dodge Challenger street machine.